At the press of a key, the seca directprint 284 measuring station transmits height and weight measurements to your existing printer. The patient receives a personalized printout outlining their nutritional condition based on their BMI. The printout provides valuable insight and practical tips on nutrition, maintaining a healthy lifestyle. Empower patients to discuss their weight and motivate them. Many times when patients go to the doctors office, all the patient does is step on the digital scale and the nurse records the weight. Then not much at all is said about the patients weight. Then once the patient sees the doctor, they may or may not mention the weight, usually it depends on time restraints or what the appointment is actually related to. Wouldn't it be nice for the patient to automatically get a targeted print-out of their weight along with BMI info and recommendations? 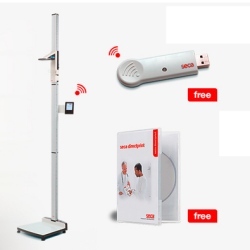 - Direct transmission of measurements via seca 360° wireless USB Adapter seca 456 and an interpretation of measurements using the software module seca directprint. - Once the patient’s height and weight are measured, an automatic printout is generated outlining their nutritional condition based on their BMI. - Network compatibility provided by seca 360° wireless technology. - Fine 50-gram division and high weighing capacity up to 300 kg. - Broad height measuring range from 30 to 220 cm. 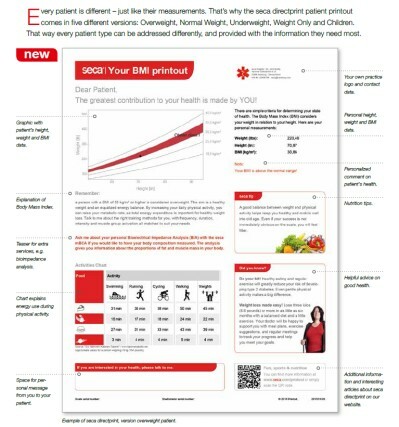 - Automatic calculation of BMI. - Three-line multifunction touch display shows weight, height and BMI simultaneously.